Apple's plans to plant 9,000 trees at its forthcoming Apple Park headquarters is putting pressure on the local market, forcing contractors working on other San Francisco projects to source trees from nearby states. Briefly mentioned in a San Francisco Chronicle profile of San Francisco's Transbay Transit Center, Apple's ambitious arboreal roadmap calls for the purchase of some 3,000 highly desirable trees, which the company is sourcing from local nurseries. With Apple in the market for trees, arborists working on projects are having trouble finding quality specimens. For the upcoming transit center, which features a 5.4-acre garden rooftop with 469 trees, landscape architects Adam Greenspan and Patrick Trollip had to travel to Portland, Ore., to locate worthy plants. By its nature, tree buying is a "surprisingly cutthroat" business, the report says. Apple's requirements for Apple Park are putting additional stress on local suppliers. When Greenspan and Trollip found a tree they fancied they would "tag it" with a locking yellow tag, so that nobody else — like Apple — could get it. Eventually all the tagged trees were moved to a nursery in Sunol, where the transbay project team leased 4 acres. To complete Apple Park, Apple had to demolish acres of buildings and asphalt parking lots on land previously owned by Hewlett Packard. The transformation from concrete jungle to green, environmentally friendly campus required forward-thinking architecture and a lot of plants. Apple itself said the final tally of trees to be planted at Apple Park is close to 9,000 specimens, most of which will be fruit trees. 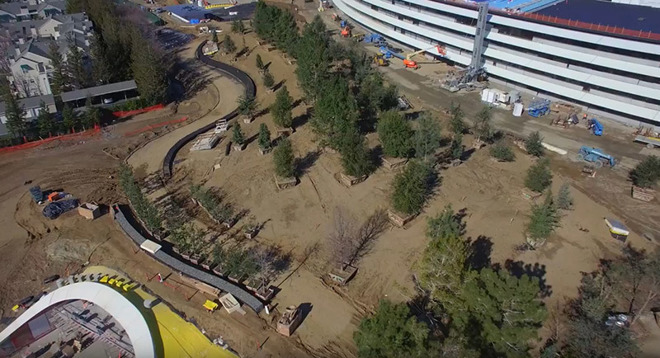 It was the dream of late Apple cofounder Steve Jobs to fashion Apple Park's landscaping after the California in which he grew up. In a presentation video made public in 2013, architect Norman Foster said Jobs thought of California as "the fruit bowl of America," and wanted the new campus to reflect the landscapes he remembered as a child. Along with a forest of drought-resistant varieties dotting the campus grounds, Apple is planting groves of apple, apricot, cherry, persimmon and plum trees in and around the main ring structure. Today's report offers balance to recent estimates that Apple Park will provide more space for car parking than it does for offices. Most of the 11,000 parking stalls are contained within two large garages, each of which is covered with solar panels, while smaller above grade and underground lots will handle overflow. Apple will begin moving 12,000 employees to Apple Park later this month. The move in process is expected to take six months to complete.